We sat down with Mia and Caius earlier this year and asked them for feedback about what they liked and didn’t like about travelling. Mia, who just turned 5 at the time, pondered carefully and then remarked that she wanted to fly less. So Erin promised we’d catch more trains in 2014, and this journey is one way we’ve stuck to that promise. We looked at different options for getting from London to Amsterdam – air, rail and sea. When we weighed up the benefits and disadvantages, rail came out on top. It was faster (total journey time), more convenient and a much more all-round pleasant experience. Being frequent flyers, we find that most air journeys can test our patience. The long (and usually expensive) taxi ride to the airport, daunting queues checking in, frustrating security checks, immigration delays and overpriced airport food options. And then once you’re on the plane, there’s (usually) no use of electronics for a substantial part of the flight, very cramped and uncomfortable seating, and dry recycled air. Air transport is not as glamorous as it looks on the billboards. Going by rail was a completely different experience. This is how we got from London to the heart of Amsterdam (via 1 connection in Brussels) in just over 4 hours. We caught the tube (underground rail) to Kings Cross St Pancras Station. Luckily, we asked a staff member at the station if there were any nearby food outlets after we check-in and she said “not really”. So there’s a helpful tip if you’re leaving London from Kings Cross. Try to bring your own food or pick up something at near the entrance of the station. Once you pass through security, there’s no going back. There was a nearby M&S mini market which sold convenient and healthy meals at reasonable prices. The kids enjoyed a special treat of Burger King. After stuffing our faces we carried our bags through the security checkpoint. It wasn’t as vigorous as what we’ve experienced in airports. In fact it was a little refreshing. Other than passing our bags through an x-ray scanner and emptying our pockets of metal, there was nothing else. No need to remove laptops and tablets from bags. No pat-downs. No ridiculous full-body x-ray scanners. And best of all, the queue was relatively short. The whole experience was over in just a couple minutes. Next was the immigration booth for a customary stamp since we were entering the Schengen Area again. But this time with no gut-wrenchingly long queues. Unlike airports, we weren’t asked any intimidating questions, didn’t have our fingerprints scanned or treated like criminals. Just a smile and on we walked. It almost seemed too easy. We had enough time before our train departure to find a seat in the waiting area and give the kids a toilet break. The departing platform for the trains was displayed on a large screen. After about 10 minutes our train’s platform pinged up and we were off. Just a short walk and ride up a travelator took us to the platform and we loaded onto the train. Easy. 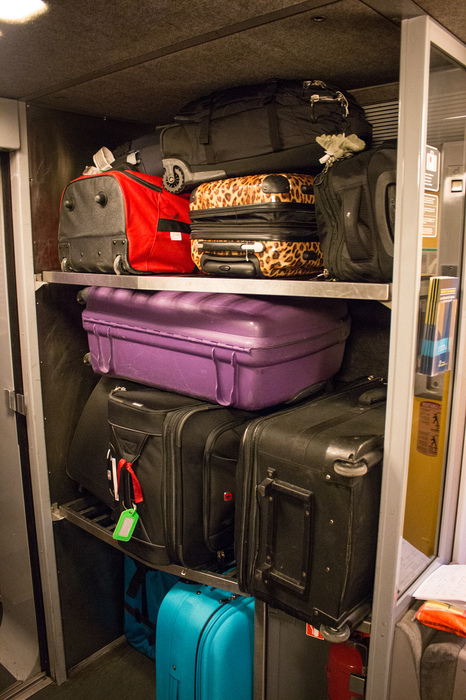 Immediately inside the train was a multi-level rack for storing suitcases securely. We found a spot for ours and then located our assigned seats. The overhead storage had plenty of space for our carry-on bags. There are luggage allowances for each passenger, but these didn’t seem to be strictly enforced, and it was definitely much more generous than what we’d experienced from airlines, so there was no need to even think about it. We were fortunate to receive 4 opposite-facing seats with a small table in between. This area was our snack station and laptop desk for the trip. Under the table was a small trash bin and along the wall were 2 power outlets. Awesome! There’s nothing more frustrating on a long flight then all your electronic devices go flat. No chance of that happening here. We plugged in our laptops and were in digital bliss. Erin got chatting with another passenger and the kids had a sleep. The gentle rocking of the train helped them nod off quickly. I used the time to do some writing, editing and photo organisation. There was no need to turn off laptops at any time. It was one of the most productive journeys we’d had in a long time. Every so often I looked up to admire the rolling fog over the scenic French hills that passed by. It felt like no time had passed and we were pulling into Brussels. Getting the sleeping children off the train along with our bags was a bit of a handful, but nothing different than if we had flown. The train platforms were very clearly labelled and it was easy to find our next train. The next leg to Amsterdam was even faster, but equally as enjoyable. 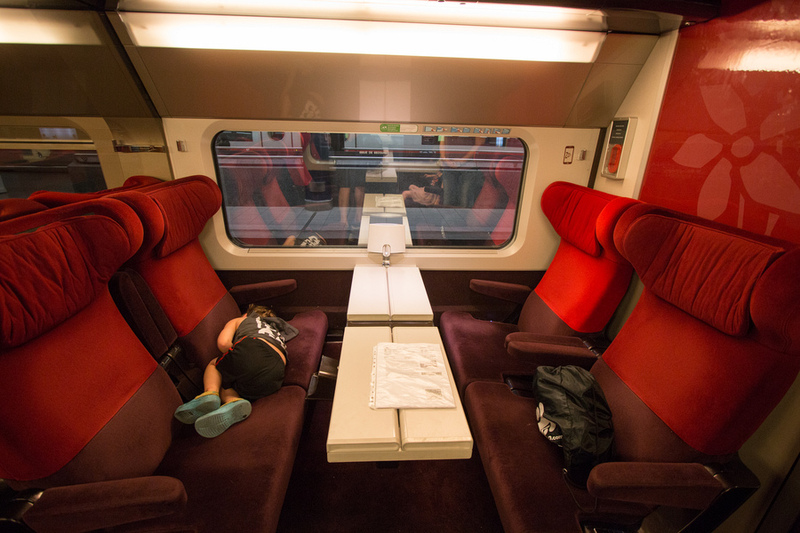 We rode first class with Thalys and were brought drinks, snacks and given seats that recline. There were not as many passengers on board so both kids were sleeping on their own seats, while we worked away. 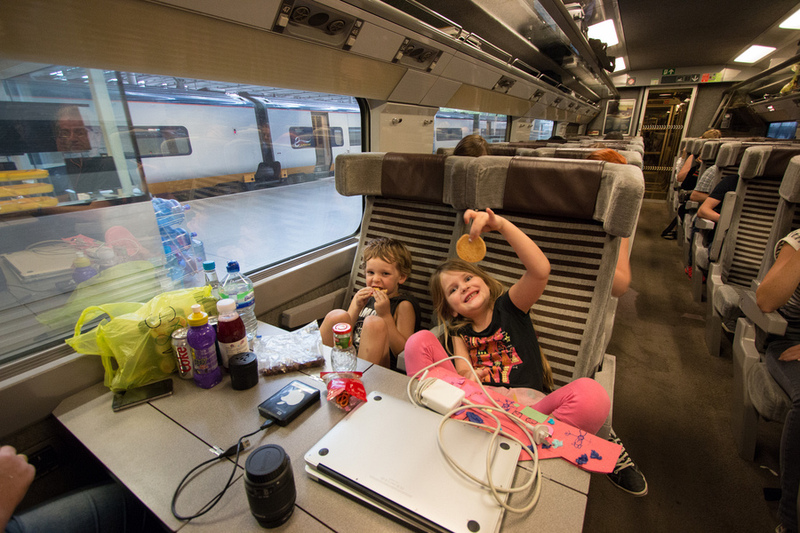 We organised our international train trip with Eurostar and would heartily recommend them for your trip. They have return trips from London to Amsterdam starting at £99 (you’ll need to book some time in advance to get the cheapest fares). And they cover more than just travel from London, with over 500 connecting fares available throughout the UK. I also like that Eurostar’s train ticket provides extra benefits like 2-for-1 entry in Europe’s most popular museums in Paris, Lille & Brussels. If you’re mindful of the environmental impact of air transport, then you may prefer train travel as a greener alternative. But for me, I just enjoyed the pure simplicity and convenience of it. I think I’ve got the train bug. I’m sure we’ll have many more train trips coming up during our time in Europe. And Mia will be happy about that. That will be handy for us, as we're planning to go to Europe for a few months starting in December. We will be heading the opposite direction in September--Amsterdam to London--and were planning to take the ferry route. We will definitely look into this though! Thanks! I absolutely love train travel. It's so much more convenient and comfortable than going by plane. 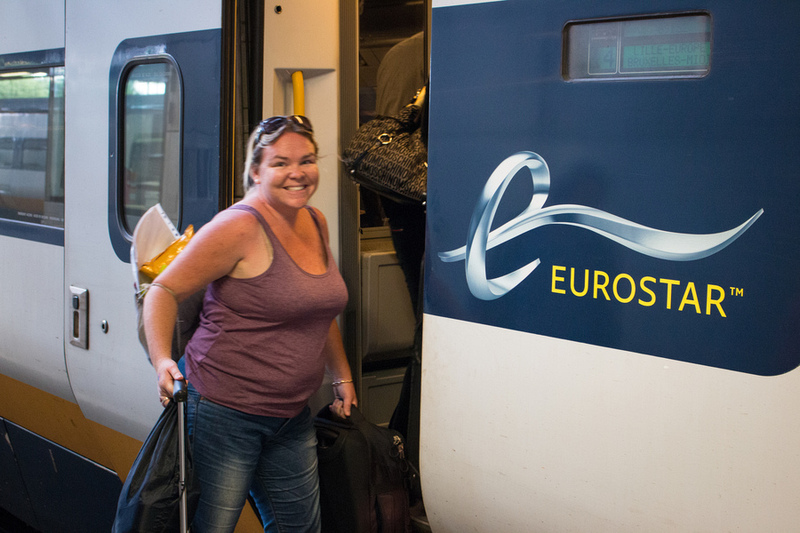 I haven't done a trip with Eurostar yet, but I will definitely consider them for my next trip. I haven't yet, but I'd love to! Hello! I stumbled upon your blog via an Instagram post about a summit and I was scrolling through the different presenters and I was specifically looking for someone with a family. My husband and I made this exact same journey during our 2010 trip to Europe and, I agree, there is something about traveling by train that is more relaxing and romantic than flying. Fast forward a few years and we have two children and are looking to return to Europe with them. I look forward to reading your blog and gaining some insight in ways to travel with children and activities to do with them. Thank you!